Over the years, I have been fortunate to taste and drink more than my fair share of the 1990 Monfortino, but this is the first time I have tasted the wine at the winery, from a bottle that has never moved. At the time, 1990 was considered a warm vintage. Interestingly, today, the conditions of that year are more in line with what is thought of as normal. But 1990 was a game changer for Piedmont. Unusually rich and voluptuous Barolos attracted a new audience to the wines and region. As is often the case with warmer years, one of the questions is whether or not the wines will age. 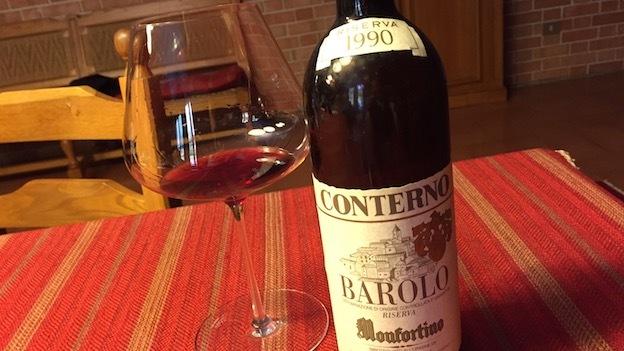 Giovanni Conterno’s epic 1990 Barolo Riserva Monfortino answers that question in emphatic terms. From the moment it is opened, the 1990 Monfortino is breathtakingly beautiful. Soaring in its aromatics, fruit and structure, the 1990 simply has it all. The more exotic elements of the ripe vintage play off a super-classic sense of structure in a compelling fashion. Hints of truffle, mocha, coffee and spice add nuance to the dark, fleshy fruit. Amazingly, the 1990 seems to just be entering its early plateau of maturity! Of course this bottle, from the Conterno cellar, boasts perfect provenance. Even so, readers fortunate enough to be cellaring well-stored bottles are in for a total sensory experience that can be matched by only a few wines in the world. The 1990 is a stunning Monfortino. It’s as simple as that. Ordinarily, I would not give a 27 year-old wine a ‘+’ in a review, but the 1990 appears to still have upside! 98+/Drinking window: 2017-2047.